PORTLAND, OREGON–Police arrested more than 20 people in the fifth consecutive day of rioting and clashes with police by mobs of leftist protesters who say they are furious about the election of Donald J. Trump as the 45th President of the United States. The rioters came even after Portland Police and Mayor Charlie Hales pleaded for calm at a press conference Saturday afternoon and protest organizers announced that they had no events planned for that evening. Hales’ and other local authorities’ statements that “peaceful protests” are being marred by a few fringe players stands in stark contrast to the protest organizers’ refusal to rule out the use of a ‘diversity of tactics,” a term that leftist protesters use to describe a spectrum of action from peaceful protests to outright violence. Exclusive footage from Breitbart News shows an example of a fight over a “diversity of tactics” maneuver as one masked anarchist attempts to block a street using a police barricade during Saturday night’s fracas near Pioneer Square. Two other protesters attempt to stop him from barricading the street and are promptly told by yet another protester that they have no right to interfere. Law enforcement officers from other agencies in the metro area have been called in to help Portland Police. Marshman said they have limited resources at PPB and the long days take their toll on officers. Earlier Saturday, police also announced the arrest of two suspects for attempted murder after a man was shot on the Morrison Bridge during Friday night’s protest in a crime authorities say is gang related. 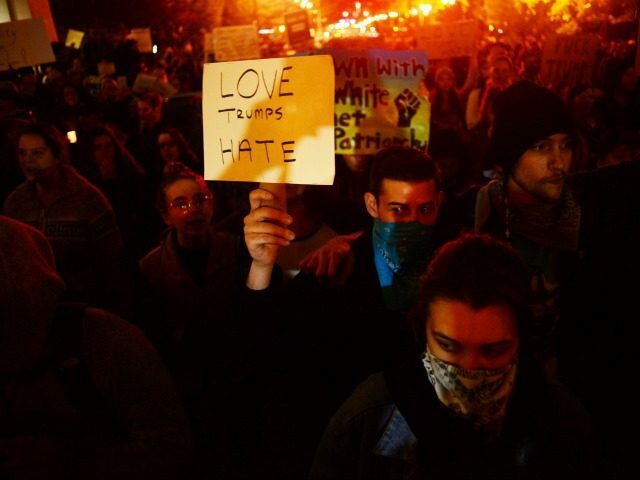 Post-election protests continued in other cities such as Los Angeles, New York and Indianapolis.